When it comes to my morning cup of coffee, I am very strict about the quality of the drink. Of course, I want a piping hot brew, but there are so many different flavours and let alone standards that different manufacturers set. With that mindset, I set out to research various coffee machines, which is where I stumbled across the Breville Barista Express coffee maker and its 1000+ verified five star ratings! The Breville BES870XL Barista Express espresso machine is now rated number one on my pump espresso coffee machine and here’s what I learned about the Breville coffee maker. One of the biggest challenges faced with coffee makers is the time that it takes to create a brew. By the time most machines are just starting to brew a pot, you are struggling to get out the door on time so that you don’t wind up in trouble with the boss. However, I was pleasantly surprised with the Breville Barista Express. The word “express” isn’t in the title of the espresso maker for nothing. After I figured out all of the tricks behind making this machine work, I was able to have a full cup sitting right in front of me. And I still had time to sit and relax before I needed to leave for the office! Even though it takes very little time to make, the coffee that comes out of this contraption is everything that you wouldn’t expect from a home machine. A rich, creamy liquid is dispensed from the Breville coffee maker, giving you that typical coffee shop quality without having to spend $4 per cup. When it comes down to the wire, the Breville Barista Express is everything but your typical coffee maker. Aside from its great quality, users will also be more than pleased with some of the additional features that really do combine to create one of the best coffee makers on the market. 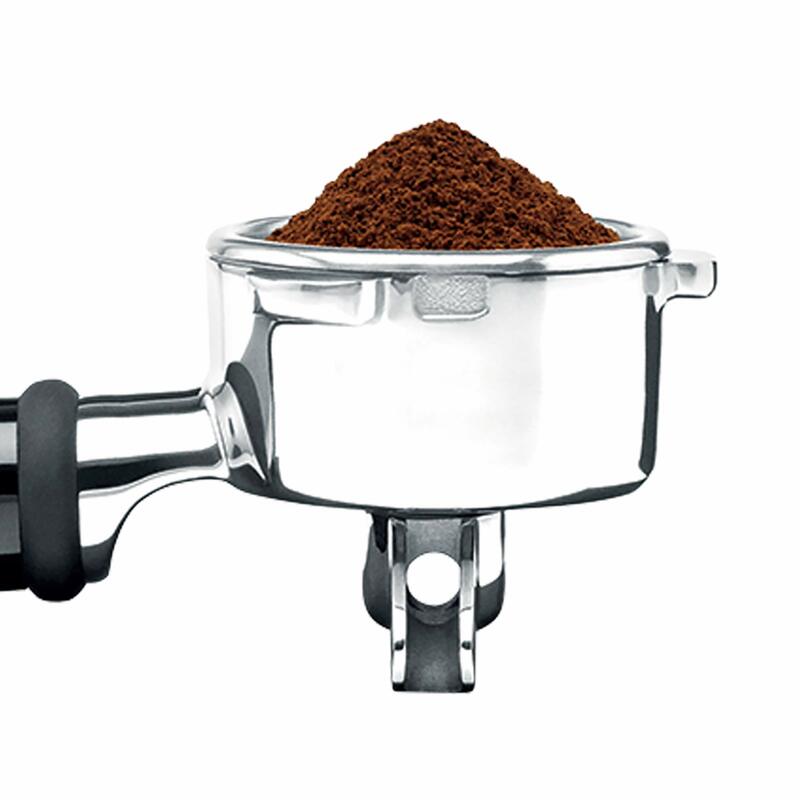 Probably one of the most convenient and desired aspects of any at home espresso maker is a grinder. It gives you the ability to have the freshest quality possible, and the best part is that you can rest easy knowing exactly what is in your coffee. While it is one of the more popular features, grinders are rarely found on coffee makers that are under $1,000. Luckily, this machine is one of the rare ones. Not only does the Breville BES870XL have a coffee grinder built in, but an excellent one at that. 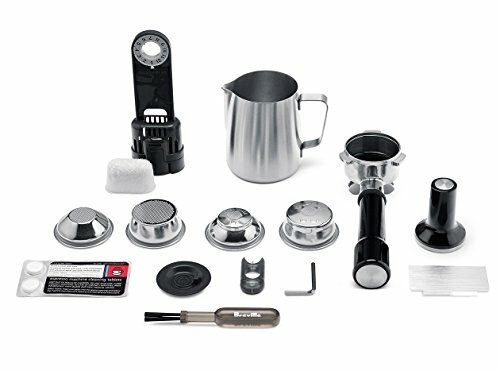 This integrated conical burr grinder with adjustable grind settings will grind down every bean to tiny bits, and I have never once had to run an additional session to ensure that everything was ground up well enough. The Breville coffee maker can be programmed to brew one single shot or a double, and the grinder can be adjusted across many settings. Another wonderful thing about this espresso maker from Breville is the way that the coffee is created. Aside from the grinder, the pressurised dual-wall filters help to ensure a creamy and frothy cup of coffee for you each and every time. These patented filters help keep out any unwanted larger grounds that could potentially ruin your enjoyment. And if you are a novice they will definitely help you create a quality espresso from the get go. For the more experienced Barista, Breville has also thought to include the regular filters that will allow you to experiment and let your talent show. So you actually get 4 filters in total, the single and double shot dual-wall filters, along with the basic single and a double shot filters. One of the most desirable parts of this coffee maker isn’t actually a physical part of the product, but more something that helps owners in knowing that they are not breaking the bank for their quality coffee. Priced under $600, the BES870XL is one of the most affordable and best performing espresso makers that is available on the market. The vast majority of consumer reviews available on Amazon for this Breville coffee maker are overwhelmingly positive. However, there were some minor comments noted. One that caught my attention was that it’s a good idea to pre-warm the demitasse when making espresso shots if you really want your espresso HOT! This is a good tip. It’s also worth noting that cleaning it can be a little awkward around the grinder, but it’s nothing a bit of elbow grease can’t handle. Between its astounding performance, quality brews, and fabulous features, the Breville Barista Express BES870XL gives all of its competitors a true run for their money. The gorgeous, stainless steel traditional design gives a certain appeal that other manufacturers just can’t seem to master, and it’s appealing aspects make it incredibly popular. If you want to experience drive-thru quality coffee from your very own home, then try the Breville Barista Express!